Most beachgoers prefer a sandy beach for swimming and enjoying the shoreline. But – as happens so often in our seawalled and bulkheaded environs –sand washes away with the current or wave action. Due to the dynamic nature of shorelines, most swimming areas require continual maintenance to keep them in the shape that the swimming public demands. 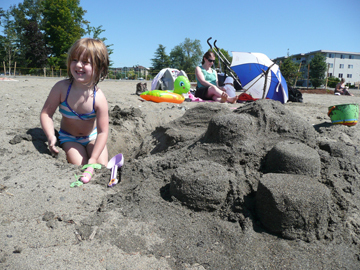 When developing a new swimming beach or restoring an old one the first thought is usually: sand, bring in more sand! To look at the situation with foresight, though, requires studying site conditions. Where did the sand go? Is a bulkhead or seawall impacting erosion? Often wind and wave analyses are required. In many cases, replenishing with sand is not a sustainable solution. Sand blows away. Sand drifts away. Looking at the long-term picture and saving owner expense requires considering, and often implementing, a less-favored solution, replenishing or filling with pea gravel, which is a more stable material. 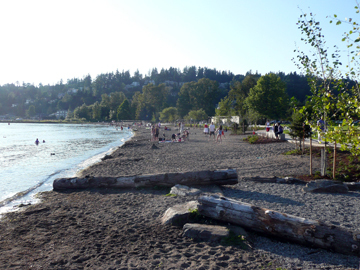 Many revitalized swimming and hand-carry boat launch beaches in high wave environments use pea gravel. 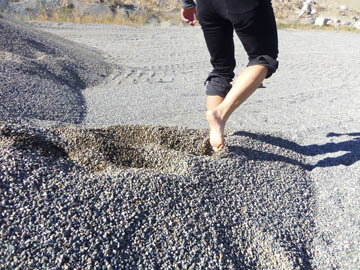 Even pea gravel will require ongoing maintenance / replenishment, but will save money over the long-term, with considerably more infrequent replenishment required than sand. Comfort. Warm sand ala Waikiki is the expectation when one thinks swimming beach. But even Waikiki Beach requires continual replenishment. Rounded pea gravel ranks lower in comfort. The other benefits of pea gravel: improved fish and wildlife habitat. Gravel provides spawning substrate for fish. This is something that appeals to the agencies and assists in the likelihood of permit approval. What does creating a sustainable beach involve? One consideration in the selection of beach material is the beach’s slope and the available land to place the preferred material. Coastal engineers study wind and wave action and build models that predict how material will move along the shore. The size and shape of potential materials are run through the model, allowing for scenarios that analyze different size materials, allowing designers to study costs and benefits of the materials. Examining the models allows designers to create a final design that minimizes maintenance costs and maximizes user comfort. Though pea gravel is more expensive initially, it is more likely to stay in place, and cost less in maintenance dollars over the long-term, resulting in a cost-effective, sustainable design solution. Aesthetics: How to make it beautiful? 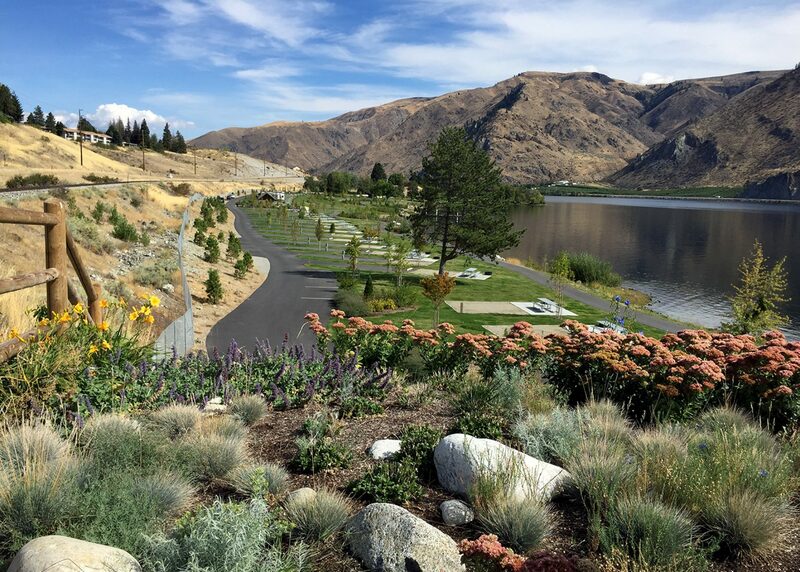 Landscape architects help select materials and design upland and nearshore plantings that are required by permitting agencies. Agencies typically require use of native plantings, and often, the placement of woody debris. With thoughtful design, these plantings and materials can create an attractive shoreline environment that blends wildlife habitat with aesthetics and public enjoyment. How to keep materials in place? In many high-energy wave action environments, gravel berms, or rock sills made with larger materials help keep pea gravel in place. The placement of these structures must not negatively impact neighboring properties. Bulkheads/seawalls contribute to the erosion of native material or sand waterward of the structure. Over time, as the sand and other native materials wash away, walls are undercut and fail. Solutions involve removing the walls or burying existing walls and creating gentle berms that extend the beach upland. The great debate of sand versus pea gravel will no doubt continue. Long-term sustainability, costs/benefit analysis, and improved habitat value make the decision to use pea-gravel the most practical in many situations.